Bored with scalloped potatoes? 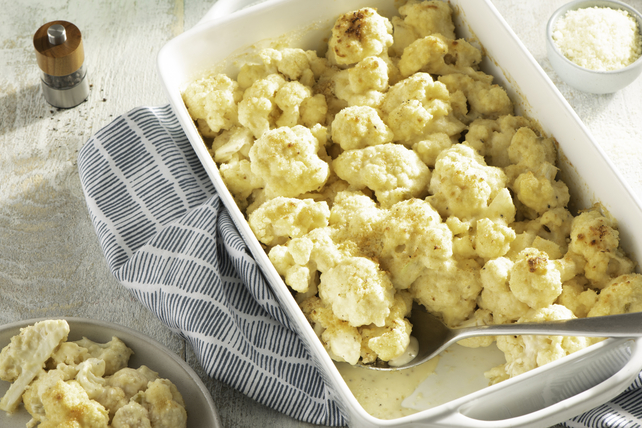 Try this Baked Scalloped Cauliflower for a change. Oven-baked with a crisp Parmesan topping, this creamy cauliflower side dish is easy and delicious. MIX soup and dressing in large glass bowl; add cauliflower tossing to coat. PLACE in lightly greased, large shallow baking dish. BLEND cheese and bread; sprinkle evenly over cauliflower. BAKE covered at 350°F (180°C) for 20 minutes; uncover and bake 10 minutes or until golden.